Assembled by Dr. Howard Knohl, this eclectic library is built around seventeenth-century English imprints covering a variety of subjects. Our selection from this singular achievement included rare Sporting and Angling (Lot 294, George Turberville’s The Booke of Falconrie or Hawking, 1611), Americana (Lot 56, Nathaniel Byfield’s An Account of the late Revolution in New England, 1689), Voyages (Samuel Purchas’s Purchas His Pilgrimes, 1624-26), Science and Medicine, and more. Literature is a particular focus of Dr. Knohl, and Sotheby’s offered a Shakespeare Fourth Folio (lot 267; $70,000 – 100,000), a good selection of John Donne, and a first edition of Milton’s Paradise Lost (lot 212; $8,000 – 12,000). Many truly curious works were offered, including books concerning Witchcraft, Astronomy, Gardening and even Pest Control (lot 291, Leonard Mascall’s A Booke of Engines and Traps to Take Polcats, Buzardes, Rattes, Mice and All Other Kindes of Vermine and Beasts, 1590). 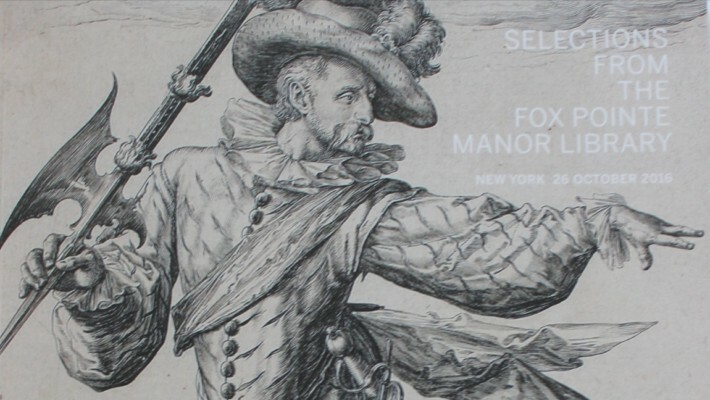 We will be presenting another selection of rare works from the Fox Pointe Manor Library in 2018. Don’t miss an opportunity to own a piece of this world renowned collection!!!! Carol Seelig Eastman is the Executive Director and Chief Curator of The Knohl Collection. In this role, she passionately explores the artist’s personal, social, and political world and places their art in a meaningful historical context. Her thematic exhibitions provide visual and educational stimulation that attract and engage a diverse museum audience. Skinner Book Sale July 20, 2018!! !